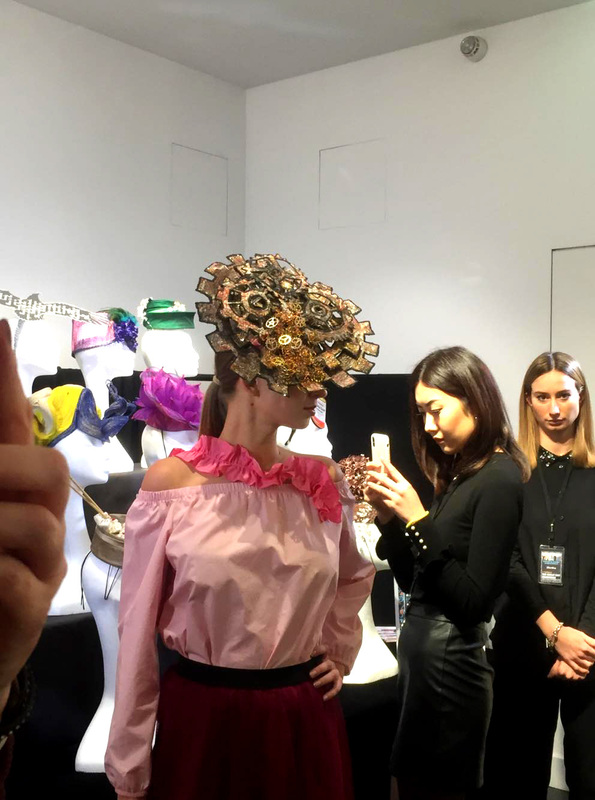 After my adventure at London at the weekend I flew back over to London on Tuesday Morning for London Hat Weeks press preview. The event was held at Pinko Boutique beside Harrods. My design Evolution was chosen as one of 32 designs to be shown on the day which I was privileged be chosen and to attend. The exhibition was upstairs in the boutique and when I arrived I had a slight panic moment as I couldn’t see my design but thankfully one of the girls put me at ease, my design was back stage with the models. My hat was on the first selection of models, they came out and walked the room for approx 20 minutes and stood for photographs in various areas of the room. It was quite a proud moment to hear people speaking about my design and taking photographs. It was also great to see Evolution in motion on a professional model. Evolution will be on display in London during London Hat week March 22nd-28th. I will be flying over to London for a few days for the preview party for the chosen milliners and press on the 21st of March. The exhibition will be open to the public from the 22nd of March. There are also various events on throughout the week which are listed on the London Hat Week website. Tickets are still available and be purchased here.